Think about what makes life possible under water. Phosphorus is the “food” that microscopic plants and animals need to survive. 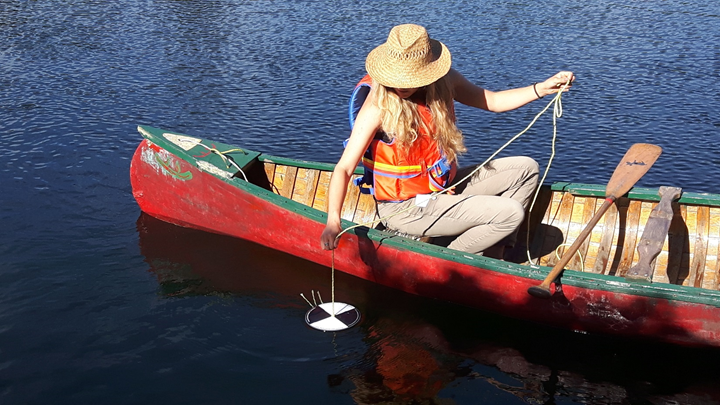 As the foundation of our food web in Georgian Bay, phosphorus is an important nutrient for us to measure when we study the health of our ecosystem. You can imagine that there wouldn’t be many fish or loons without healthy nutrient levels supporting the rest of the food web! Phosphorus levels affect algae growth and water clarity, in turn affecting swimming, boating, fishing and aesthetic enjoyment. Without clean and safe water, many of our favourite summer activities are at risk. Too much phosphorus is not a good thing – but neither is having too little. Georgian Bay receives nutrients that are brought through the watershed from many rivers. Organic materials and nutrients from land travel into lakes with spring runoff, raising the phosphorus levels early in the year. In shallower, protected bays or near wetlands, phosphorus levels can be much higher, which is good for fish habitat. This type of nutrient-rich habitat is considered more productive, supporting more species of algae and phytoplankton, as well as a more diverse food web. When nutrients are trapped or concentrated in warmer, shallow waters (such as in late summer) an algal bloom may result. These algal blooms make water less attractive for boating and swimming, and if you draw lake water for drinking, it will taste and smell foul. Algal blooms can also produce cyanobacteria, or blue-green algae, which can create toxins dangerous to both wildlife and humans. Since the 1970s, people in Ontario have made efforts to reduce phosphorus loads to surface water. Nutrients from sewage-treatment plants have been greatly reduced, and there is less phosphorus pollution, from agriculture and stormwater. They still remain but are much lower than they were in the past. In the offshore, deep waters of Georgian Bay, phosphorus levels have been naturally low, but for the first time in recorded history, concentrations are now as low as those of Lake Superior. The low level of phosphorus represents an unprecedented low level of nutrients—critical in the open-water system for a healthy food web and stable fish community. Why has this occurred? The answer is probably very complex. The invasion and rapid spread of zebra and quagga mussels has resulted in the loss of phytoplankton and zooplankton from the lake due to the mussels’ immense capacity to filter lake water. Their feeding seems to have used up most of the nutrients in Georgian Bay, and this is having a destabilizing effect on the aquatic ecosystem. Most likely, several factors are interacting, and more research will be required to understand this phenomenon. Keep a buffer of vegetation along shorelines, which reduces nearshore nutrients. Lower your household phosphorus pollution by avoiding detergents and soaps. Maintain your septic system properly to avoid leaks and nutrient spills into water.